The Tabard Inn Library was founded in 1902 by Seymour Eaton. It was administered by the Booklovers Library, another Eaton enterprise. Eaton was a remarkable entrepreneur and promoter who was also an author, journalist, and educator. He was the author of the "Teddy Bear Books". 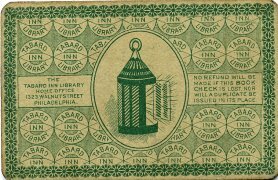 The Tabard Inn Library was a membership library with stations in the form of revolving bookcases located in drug stores and other commercial establishments throughout the United States. In an initial advertisement for the library, Eaton indicated that 10,000 of these bookcases would be manufactured at a rate of 25 and then 50 a day. 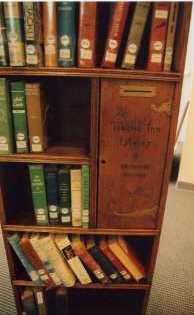 Photographs of a Tabard Inn Library Bookcase located in the Elisha D. Smith Public Library in Menasha, WI. The bookcases held 120 books which were to be changed from a central location every week. A member deposited five cents in a compartment in the bookcase (see left) to exchange a book. The carved message around the top of the bookcase reads "The Best Reading Rooms In the United States Are the Homes of the American People". Illustration of a Tabard Inn Library bookcase from a promotional brochure. 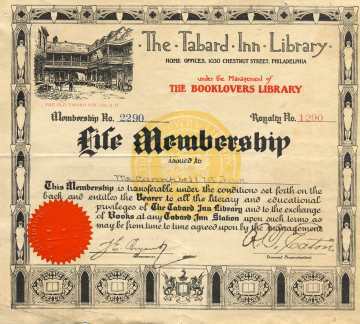 A membership certificate for the Tabard Inn Library. Initially, a lifetime membership cost $3.00 and was good anywhere in the United States. The cost of membership was later reduced to $1.50. Eaton used this procedure to develop a mailing list containing the names of a million men and women. He used the list to promote other ventures including the Tabard Inn Food Company. 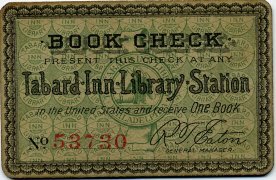 Book Check good for one book at any Tabard Inn Library Station. An early bookplate for the Tabard Inn Library. It features an illustration of the Tabard Inn in England around 1385 A.D. 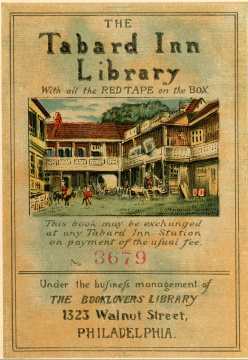 The books of the Tabard Inn Library were housed in sturdy black cases with red tape around the outside. This led to the slogan "With all the Red Tape on the Box". The Library of Congress has a special Tabard Inn Library collection of 87 items in its Rare Book Room. According to Ken Carpenter this collection originally belonged to Jacob Blanck. Eaton's conglomerate of enterprises came to an end in March, 1905 when Eaton declared bankruptcy.